‘BRING BACK FLOGGING!’ We hear it often enough, and there would be plenty of volunteers to carry them out, but it’s been a very long time since anybody saw one happen in a Queensland prison. As with hangings, it is something that has disappeared from public memory and little is known about what it was actually like. Despite this, we do have some surprisingly graphic accounts of 19th-century prison floggings in Brisbane thanks to the relative transparency of the prison authorities and the news media of the time. 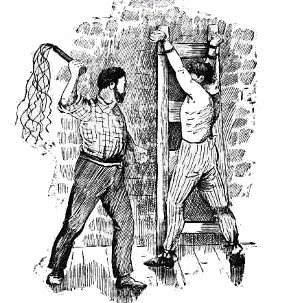 The following tale of prison floggings follows the punishment of three so-called 'larrikins'. They were Daniel Carmichael, James Toohey, and William Phillips, who one July night in 1885 garroted and robbed Bill Campbell near the Exchange Hotel in Charlotte Street, Brisbane. They were soon caught and convicted of the assault. Toohey got two years’ hard labour, with two floggings of 40 lashes each, and Phillips received two years and two floggings of 30 lashes each. Carmichael (who had also attempted to use a knife on the arresting constable) got two years and three floggings - the first with 50 lashes and the other 20 with 40 each. Floggings were of course nothing new to Brisbane, and the original Moreton Bay Penal Settlement of the 1820s was notorious for the ferocity of the lashings ordered by Captain Patrick Logan. 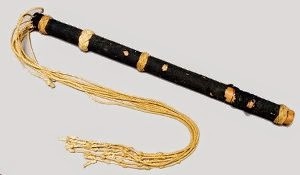 The convict days, however, were long over and floggings of the late 19th-century were handed out only occasionally and privately in limited amounts and care was taken to provide on-hand medical supervision. The first round of the floggings of the three garrotters happened in an exercise yard at the still-newish prison off Boggo Road on a Saturday morning in September 1885, just a week or so after sentencing. Two other prisoners joined them for similar punishment that day. One was Johnny, an Aboriginal man from the Dawson River, sentenced to 25 lashes for attempted criminal assault on a young girl, and the other was a Townsville youth named Miles, sentenced to 25 lashes for criminally assaulting a young girl. Such men were transported to Brisbane to receive their punishment because that was where the hangman was based. It was part of his job requirement and not one he relished, because in contrast to his more fatal line of work his flogging victims might meet well bump into him in the street in time to come. The hangman was 1885 was a new one, Henry Flude, a Fortitude Valley greengrocer. He was described that morning as being ‘a powerfully built muscular man of middle age, bareheaded and stripped to a light jersey and pair of trousers’. He held the dreaded cat-o'-nine tails, comprised of a lightweight handle about 75 cm long and covered in green baize, attached to nine thick pieces of whipcord 90 cm long with four knots in each. Also present that day were reporters, three parliamentarians, prison warders, the under-sheriff and two doctors. Carmichael, the first to be flogged, was tightly lashed by the warders to the timber ‘triangle’ on the side of the punishment yard. He was stripped to the waist and his arms were stretched above his head and lashed to the top of the triangle with cord, with strips of blanket wrapped around his wrists to prevent the cord cutting into the flesh. His legs were stretched apart and strapped just above the knees to the framework, and another strap around his waist bound him tightly to the crossbars of the triangle. Once again blankets were placed between him and the apparatus, with one stretched across for him to rest his head against. He was now only capable of very little movement. By the 40th stroke Carmichael was close to fainting, only capable of uttering quiet moans, and his limp body hung by his arms. After Woodward called out ‘fifty’ he was untied and cut loose and two warders supported him while water was poured over his head and down his throat, although he could not hold his head up to drink. As he was led away he murmured ‘Oh, I'm innocent ; I'm innocent’. The executioner quietly walked back to his room before his next victim, Toohey, was brought into the yard. The other prisoners had been in an adjacent yard waiting their turn, and could hear but not see what was going on over the yard wall. 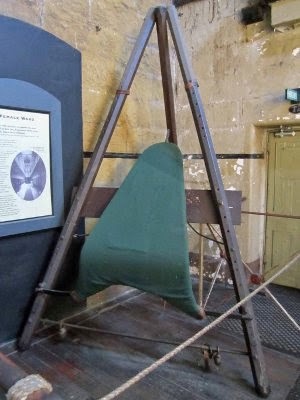 The flogging triangle displayed at Old Melbourne Gaol. Toohey was a young man and approached the triangle with a confident swagger, but his attitude changed as he was strapped to the frame. He managed to keep his eyes fixed on Flude for the first three lashes but cried out after the fourth. That said, he did take the punishment with ‘great fortitude’ and even though this flogging was somewhat more severe than the previous one, Toohey generally managed to stifle his groans. Despite this the pain he was suffering was evident by ‘the trembling of his flesh and convulsive quivering of his legs’. At the end he was given water and led away in a semi-conscious condition. At this point the blood-soaked knots on the cat-o'-nine tails were becoming loose so Flude swapped it for a new one. Miles, the last of the prisoners, generally behaved as though nothing was the matter, although his arms and legs trembled violently. He said to Flude, ‘Don't hit me on the ribs, old man; hit me fair on the back’. At the ninth stroke he called out a reminder, ‘Hit higher up, not underneath the ribs’, as he did with the fourteenth. Apart from that he was quiet during the punishment. Once untied he refused assistance, saying, ‘You needn't hold me; I'm not going to faint for 25 lashes; I don't want any of your water’, and left the yard calling out, ‘I could take 200 lashes; it isn't the first time I've had a taste of the cat’. Each prisoner afterwards received treatment from the doctors, who laid spermaceti plaster on their back wounds. The three garroters were said to be ‘now as meek as children’. Carmichael sat cowed on his bed, while Toohey was semi-conscious, suffering intensely and feeling faint. Phillips, who had refused assistance from the warders, was now lying face down on his bed at full length ‘in a half-fainting condition’. He attempted to appear indifferent but was betrayed by his continual twinges of pain. The three garroters were handed their second installment of pain in November. As the time approached they were reported to have an ‘uneasy demeanour’ and Phillips, the first to the triangle, was ‘pale but firm’. He screamed or groaned every time the cat flayed his back, and when they reached 21 of his allotted 30 lashes the doctor raised his hand to stop the proceedings. He judged Phillips to be too exhausted to take any more and he was assisted back to his cell. Toohey was next and appeared determined to not cry out, and he held out until the fourth lash but then screamed his way through the next 36. Carmichael would have unwillingly heard every one of those cries and when his turn came he was clearly terrified. He was strapped to the triangle, the scars of his previous flogging still fresh, and even before the scourger’s arm was raised for the first time Carmichael ‘gave vent to a piercing yell’. This continued until his 13th lash before the doctor intervened again and Carmichael was taken back to his cell, where he broke down and ‘sobbed piteously’, obviously horrified that a third flogging was yet to come. All three prisoners were given a small drink of brandy both before and after their punishment, and even now still protested their innocence. Carmichael’s final flogging took place in late February 1886. By this time he was apparently ‘completely unmanned’ and afraid that the third flogging would be too much for him. As he was conducted to the triangle he reportedly ‘looked the picture of abject terror, his face pale and contorted, and the muscles of his back and legs quivering with fright’. Once strapped up he turned to Dr Hobbs and said, ‘O, doctor, tell him to be quick about it, tell him to be quick about it; oh God! oh God!’ He leaned his head against his arm and began moaning. Hobbs ordered that brandy be given to Carmichael. Although Flude applied the lash with regularity and rapidity it was clear that he was ‘laying it on very lightly’. Despite this, Carmichael groaned with every stroke and for the 15 kept calling out ‘Oh, have mercy, have mercy!’ Then his head sank between his arms and he groaned until the 40 lashes were up. At the end he was taken down and given more brandy and water. 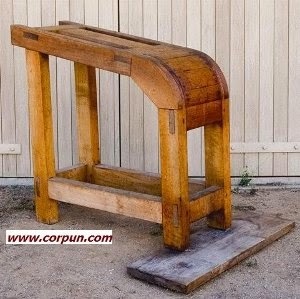 The kind of corporal punishment frame used in Queensland prisons in later decades. 1931: 'Judicial whippings. No regular official' (Sunday Mail).